An English Rose in France: Aperatifs at the neighbours. The United Nations, well some of it. Dutch, French and English. The suns a shining, most of the works done, well you need to save some for tomorrow. 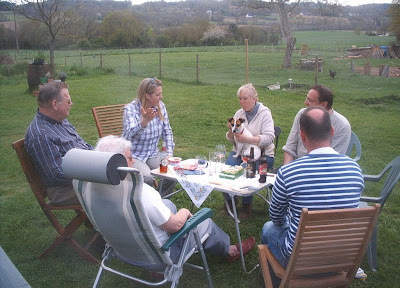 Easter Sunday, what's nicer than sitting in the sun enjoying a relaxing drink with friends. Paul had four bottles of English ale in the fridge so what a good time to introduce foreigners to real beer. Old Peculiar, Furry Ferret, Speckled hen and a Old Hookey, a couple of bottles of Rosé and some Brie. 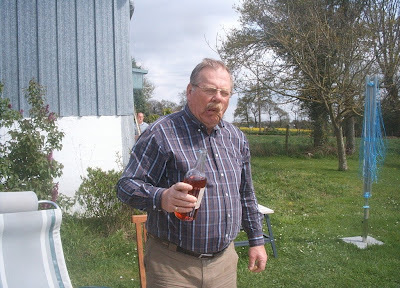 Although Im not sure Olaf was enjoying his wine. Its a shame, but although April days can be warm and a promise of summer to come, as evening approaches it starts to get a little chilly, so back home for Sunday lunch, Coquille St Jacques followed by the last of our home produced legs of lamb, glazed carrots and roast potatoes, washed down with a cheap bottle of red wine.